For the month of May the Russo Lee Gallery is pleased to present Juxtapositions by Sherrie Wolf. In this exhibition, Wolf revisits some previous themes such as bountiful floral and fruit arrangements, museum postcards and art history books. 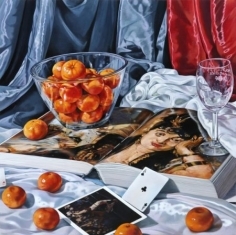 But in Juxtapositions, she also stretches considerably into more unusual and highly demanding still life material. Whether it is French flea markets with countless irregular shapes and patina, or studio scenarios replete with jars of luscious pigments, Sherrie Wolf applies her signature mastery of lyrical form and color. Wolf has dedicated her career to the revelation that art is artifice and magical in its illusions. 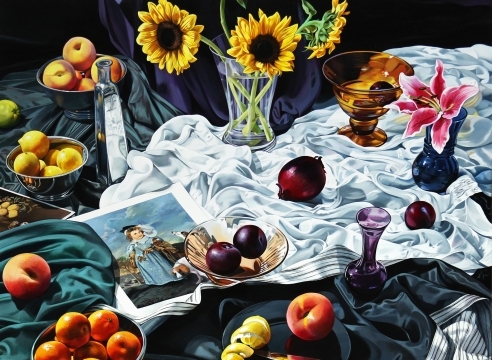 Her practice of juxtaposing exactingly realistic still life painting with a variety of references from art history creates works that are kaleidoscopic in their impact. Cascades of lush drapery, riotous tulips, and fleshy, ripe fruit overflow to create paintings that are tactile, sumptuous and sensuous. Painter Frank Stella said, “In great art all the relationships sparkle, radiating coherence.” In Sherrie Wolf’s still life paintings there is marvelous rendering of fruits, flowers, reflections in glass and copying of old masterworks, but the key element in her work is the musicality of the relationships among all the objects depicted—the loud, the quiet and the spaces between them. Wolf takes a genre with a 2,000 year history and keeps it fresh and new.